Clean around table and chair legs with the unique L-shaped power nozzle with headlight. It's design allows for cleaning under furniture, beds, and kitchen counters. Electrolux power nozzle fits Electrolux Canister Vacuum models Epic 6500, 7000, Lux 9000, 49449, 49668, Central Vacuums, Guardian, Epic 8000, Legacy and Renaissance. 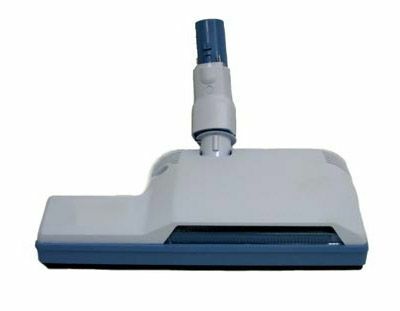 it also works as a central vacuum accessory alongside the Electrolux Superlux Central Vacuum Hose. This listing is for troubleshooting and informational purposes so please ask a question below or call 866-972-8227 for technical help. No manufactures warranty is provided on our services for this item. eVacuumStore.com is not affiliated with Aerus. Answer:Call 866-972-8227 and ask for Raymond. Answer:It would be the correct replacement for N109J but is no longer available, please call 866-972-8227 for assistance upgrading your machine or central vacuum system. Answer:At this time this power nozzle is no longer available. Answer:Can you please advise what parts you need and we can direct you in the right direction. Answer:Sorry but a schematic is not available. Do you know what part may be missing or can you please describe the problem. Answer:Yes, this will work on model 1684. Answer:If you have to press the reset button when it stops than you may need a new reset button, brush roller, or motor. If the power head just cuts out than chances are the problem is the elbow. You can remove the screw cover on the front of the elbow and then remove the front cover so you can check the wires inside the elbow since they usually go bad. Answer:This is the correct replacement for model n109. Answer:The epic power nozzle is compatible with N137S so please call for availability. Answer:Yes, this is the correct power head replacement for the Lux 5000. Answer:No this part will not fit model 1692. Answer:You will want the PPN1 which is compatible with the Electrolux regency. Answer:Yes, this is compatible with model N137M. Answer:You need to remove all the screws on the bottom of the power nozzle and then the top cover will come off. Answer:The Epic power nozzle is the correct replacement for model N106M. Answer:You will want part number PP1 to replace the Electrolux Omni-flo Automatic. Answer:Wands are not included with this power nozzle. Answer:This is the replacement for the N109J. Answer:Yes, this part is compatible with Electrolux model N137A. Answer:You will need to look at the model number on the bottom of your existing power head to determine if this is compatible. Answer:Its most likely the Elbow and not the motor that causes the power nozzle to cut out. Answer:This would be the correct power nozzle for you model E130G. Answer:This is the power nozzle for your machine, give us a call to order. Answer:No this is the only power nozzle. Answer:We currently do not have this power nozzle available. If you are looking to upgrade your machine call 866-972-8227.